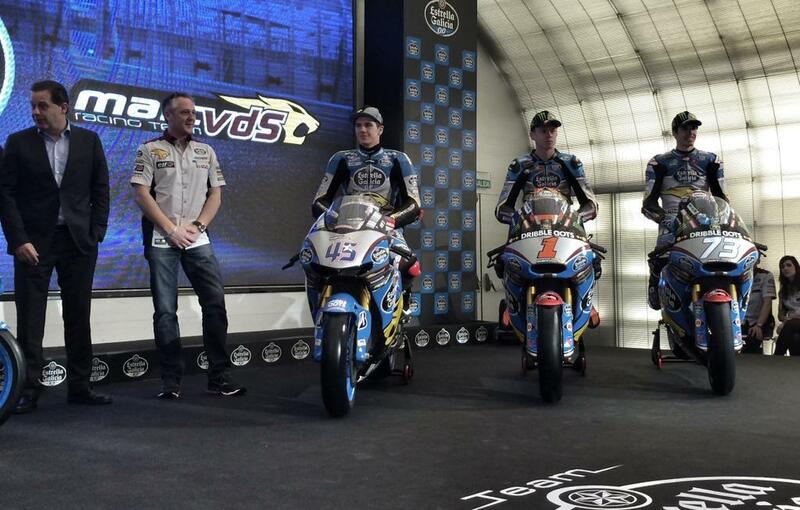 In perhaps the largest launch in memory the Team Estrella Galicia Marc VDS squad unveiled their 2015 lineup with MotoGP, Moto2, Moto3 and CEV championship squads all represented in Madrid. The main interest will be focused on Scott Redding's MotoGP machine but the team's plans for their academy, which will be used to blood both engineers and riders, was also a key element of the launch and the team's plans going forward. For Redding it's clear that the coming season is one that he understands the pressure that he will face and the Englishman looked relaxed as he gears up for his first MotoGP season onboard a Factory specification bike having ridden the Open Honda last year for Gresini. "The bike looks really nice and I'm very happy to have the opportunity to come back and have a factory bike underneath me," said Redding. "It's not been a difficult winter but it has been an interesting winter. We know that the first race of the season isn't in Sepang so we've been working towards Qatar and being in a good position for it. We'll work hard to make progress and get faster and faster through the season and trying to get on the podium. Speaking to MCN prior to the launch Redding outlined the progress that he has seen throughout the winter as a key reason for optimism of progress throughout the season. "I feel good on the bike and I'm really happy with those things. I think that the job that we've done has been really good; when you look at Valencia we were over three seconds off the pace, last test was over two seconds and today was 1.5s so we're getting closer and making progress which is our target. The team is mega here and I still can't thank everyone enough for putting this together." In the smaller capacity classes the team will once again be aiming for championship honours in 2015 with the team starting the Moto2 season as clear title favourites with Tito Rabat returning to intermediate class to defend his title. Rabat will be joined by Alex Marquez with the reigning Moto3 champion making the move to the class and aiming to emulate his brother who was the 2012 champion. While the winter has once again shown that Rabat will start the season as title favourite the champion knows that defending the crown can sometimes be a much greater challenge than winning the first title, "Winning a title was difficult but the challenge to retain it will be even more difficult. Your rivals get stronger every year but I'm looking forward to the new season getting underway." 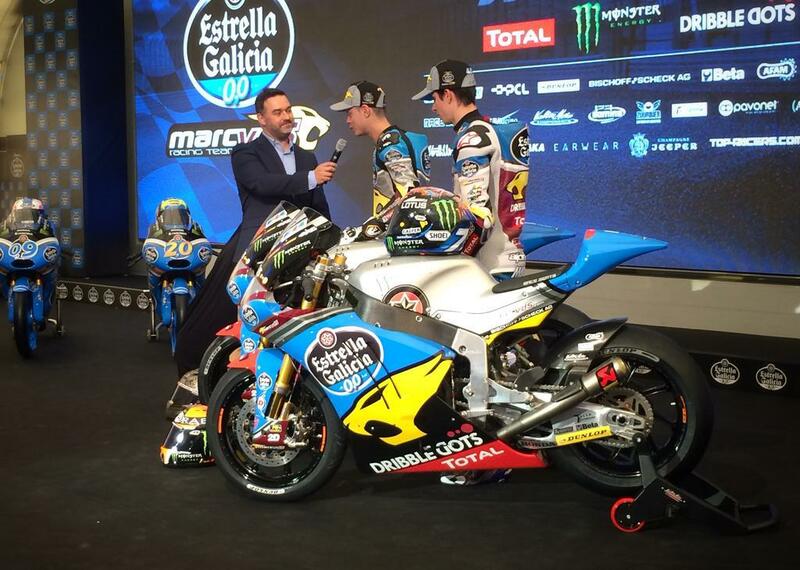 In the Moto3 class the new collaboration between the teams sees a very strong rider lineup with Fabio Quartararo and Jorge Navarro teamed together. 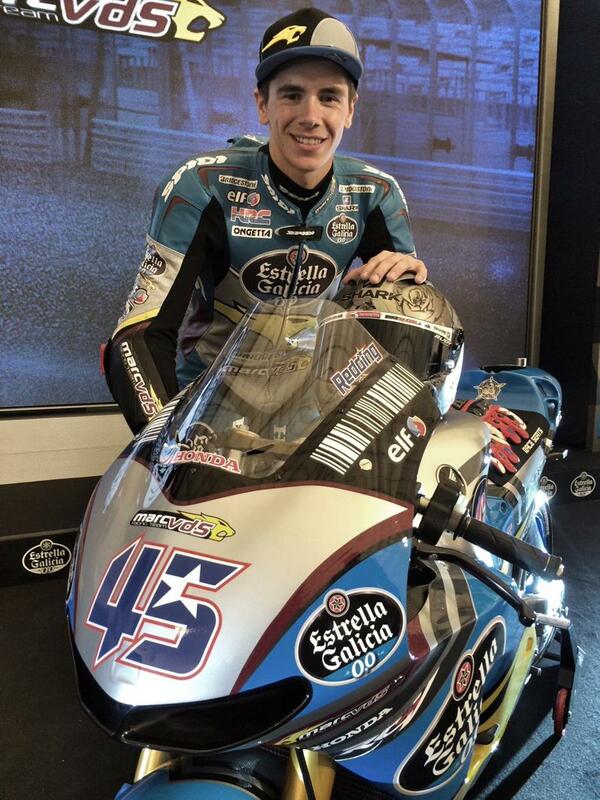 Over the winter Quartararo has done little to dampen expectation for this year. The Frenchman has won the Spanish CEV championship for the last two years and he comes into the World Championship as the most heralded rookie in years. Speaking at the launch however Quartararo was keen to downplay expectations and instead said that he is focused on learning as much as possible in his rookie season. "Testing has gone well and we've got a good base setting already so I'm looking forward to the season and there isn't any pressure on me, I just want to do my best," said Quartararo. The new season will begin in Qatar on March 28.